Guided to his Personal Best! 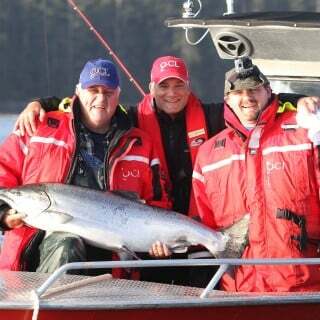 Last week at the Lodge, Mark Kasumovich – QCL Guide & Sales Representative – guided a wonderful individual into a battle with the largest salmon of his life, a 45lb Chinook. The most fulfilling moment of guest Doug Weis’s career ensued moments after he slipped the net around his fish and swung it into the boat. He turned to his son and guide Mark, and with a tear-stained eye he said that it was one of the happiest days of his life! Doug and Justin, you came to the Lodge as friends but you left as family! We hope to see you both up again sometime very soon.